One of the well-loved types of cloud is cirrocumulus clouds. What does it say about the weather? Let's find out. Cirrocumulus clouds are clouds that have small white fluffs forming gorgeous patterns spreading out hundreds of miles all over the sky. These clouds sometimes appear in grayish color that resembles fish scales earning the name “mackerel skies”. Cirrocumulus clouds do not appear with other types of clouds to produce larger cloud structures. Moreover, they do not generate rainfall although they signify cold weather. These clouds belong to high level clouds located over 16,500 feet above the ground. It is mainly composed of ice crystals because temperatures at this atmospheric level are very low and favorable for ice crystal buildup. Cirrocumulus clouds exhibit features from both cumulus and cirrus clouds. It should not be confused with altocumulus clouds, however, because cirrocumulus does not have shading, while some parts of altocumulus are darker than the rest. Cirrocumulus cloud comes after cirrus cloud during warm frontal system. This type of cloud is further classified into species and varieties. Cirrocumulus in this category exhibits tower-like structures rising either in sheets or layers. Atmospheric instability at high altitude is responsible for the tower-like occurrence. These clouds are characterized by small bunches with smooth heads and shabby bottoms. They are also a result of unstable air at the cloud level. This form of cirrocumulus cloud has extended horizontal layers or fields of clouds. They appear like small cirrocumulus spanning the sky and may have spaces between individual cloudlets. From the Latin word lenticularis which means lens, cirrocumulus lenticularis appears like lens which are often elongated with clear boundaries. They form as a result of the rise of stable air. Cirrocumulus undulatus has a wavy appearance, covering small parts of the sky. It may also appear in groups of small layers or patches. This occurs as a result of wind shear. Cirrocumulus cloud appears in ragged round holes in cirrocumulus lacunosus. This type is quite notable for its honeycomb-like structure with ragged edges. Cirrocumulus lacunosus is rarely visible, though. Cirrocumulus mamma has sac-like protuberances at the underside of the cloud. Cirrocumulus clouds form when large mass of moist air at the high-level atmosphere saturates forming ice crystals. This happens because of the unstable air in the cloud level giving the cloud its cumuliform look. In addition, cirrocumulus clouds also develop when cirrostratus or cirrus clouds are warmed, causing the air to expand and sink within the cloud. No wonder cirrocumulus is closely associated with those clouds. These clouds may appear in white or gray hues, in small rounded wisps. They can also emerge as a wavy appearance and in long rows. Sometimes, they may look like altocumulus clouds but they are located higher in the atmosphere and appear smaller and without shadowing. Cirrocumulus can even appear in spectacular array of colors. 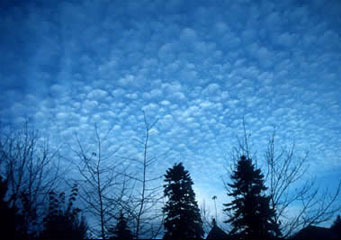 Cirrocumulus is commonly seen during the winter season although their distribution is worldwide. Also, they are found amid other cirrus clouds.